External affairs minister Sushma Swaraj says India`s image has grown almost overnight under prime minister Narendra Modi. Ruling out any possibility of talking with the Pakistani army, external affairs minister Sushma Swaraj has said that "governments only talks with governments, (and) not the army or inter-services intelligence." Stressing that the Narendra Modi government had taken all initiatives to extend diplomatic dialogues with Pakistan, she said Islamabad had "derailed the process". She added that she did not see the point in Pakistan high commissioner to India Abdul Basit "inviting" Kashmiri separatists for talks just before the foreign secretary-level talks between the neighbours, which were to be held on August 25. However, "there are no full stops in diplomatic journeys but only commas and semi-colons", Swaraj said in her maiden media briefing on Monday (September 8), more than three months after assuming charge. About repeated ceasefire violations by Pakistan along the line of control in Jammu and Kashmir, Swaraj said that dialogue between the directors general of military operations has started. Asked about the BJP's changing attitude towards Islamabad – from the Pakistan-bashing during the election campaign to inviting Nawaz Sharif for Modi’s swearing-in ceremony in New Delhi on May 26 and then calling off bilateral talks, the foreign minister said there is no discrepancy and the foreign policy of the government got into its stride only after the Modi government took over. She did not confirm or deny reports that Modi would meet his Pakistani counterpart Nawaz Sharif on the sidelines of UN general assembly starting September 24. Terming India's relations with China as one of "competition as well as cooperation", Swaraj said she expects China’s president Xi Jingping's visit to India this month to have substantial outcomes. She added that since India believes in one-China policy – New Delhi respects sensitivities regarding Taiwan and Tibet – China must also believe in one-India policy and respect India's sensitivities for Arunachal Pradesh. The minister also announced that before the end of the financial year all the seven northeast Indian states will have passport centres to issue passports. Elaborating on the differences between the UPA and NDA's approach towards the United States, Swaraj said the US will talk to a “strong government this time, and that will make all the difference". US president Barack Obama is scheduled to meet Modi on September 30 in a departure from norms, as the US does not hold bilateral meetings while UNGA is in session. Swaraj said the Modi-Obama meeting will be focused on realising the full potential of Indo-US relations. Calling her government "pro-active, sensitive and strong", Swaraj said that the first three months were "challenging" with regard to diplomatic interventions but successful. Stressing that Modi's image as a leader popular with the people is increasing, she said the “pratibha” (image) of India has been enhanced almost overnight under the prime minister, with foreign dignitaries heading towards India. She pointed out that foreign ministers of all P5 countries (permanent members of UN security council) have already visited India, apart from foreign ministers of Singapore, China, and five secretaries from the US, among others. Apart from those visits, Modi also has had 11 bilateral meetings with Latin American countries on the sidelines of the BRICS summit in July, she said. She said the priority of the government is working with the neighbours, which explains the invitation to all Saarc leaders on Modi's swearing-in ceremony and the holding of eight bilateral meetings with heads of state in the subcontinent on the first day of government. More important than the invitation was the acceptance of invitation by all these leaders, Swaraj said. She also said that the prime minister chose Bhutan as the first country for his overseas visit, while she went to Bangladesh for her first foreign visit as the external affairs minister. India has also decided to invite all 54 nations in the third India-Africa forum summit, scheduled to be held at the end of this year, as opposed to a customary smaller number. 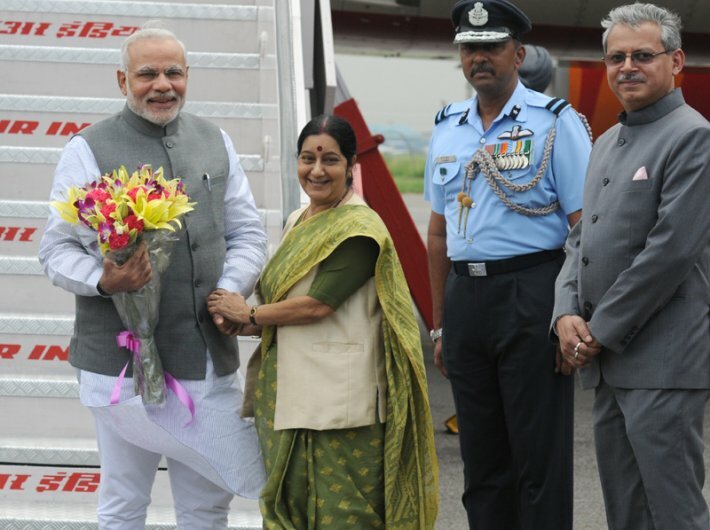 This, Swaraj said, is to enhance India's relations with the African continent. Calling her government "sensitive" towards Indians living abroad, especially in trouble-torn areas, Swaraj said they have evacuated 1,000 students from Ukraine, 6,593 workers from Iraq, and 3,183 people from Libya in the last three months. The 39 Indian workers captured by the Islamic State remain "safe and unharmed" but there is no direct contact with the workers.